Ensemble Mirable : Influenza Italiana. Rare and extraordinary music of the baroque. 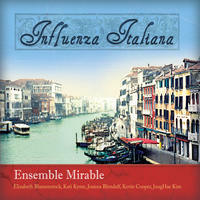 Influenza Italiana, or the influence of the Italian style, is the unifying theme of this marvelous collection of baroque works presented by Ensemble Mirable in their latest recording. The composers represented on this recording are all either Italians who helped develop the unique Italian style of baroque composition, or other Europeans who were influenced by the Italian style; incorporating Italian elements such as the agitated style of Claudio Monteverdi or the virtuosic instrumental styles developed by such composers as Biagio Marini and Dario Castello. Among those represented here are Dietrich Becker, Dietrich Buxtehude, Marco Uccellini, Diego Ortiz, Giovanni Battista Buonamento, and Andrea Falconieri. With this latest recording Mirable continues to present lesser known baroque works performed by some of today's finest artists using period instruments. Their lyrical and virtuosic performances breathe new life into these oft forgotten masterworks, reminding us of the glorious music that arose amidst the backdrop of severe hardship frequently experienced by composers of this time period, many of whom were affected by the black death that wreaked havoc in Europe from the 1340s through the 1770s. This recording reminds us both that the Italian influence extended far beyond the borders of what is now Italy, and that life in the 17th century brought with it inconceivable hardships yet managed to produce some of the finest music ever written. License Rare and extraordinary music of the baroque by Ensemble Mirable for your project. Play the music of Ensemble Mirable in your restaurant or store. Tasabasaba by To Life! : Music as a journey through tribal landscapes, rhythmic dance, hypnotic trance.